now supporting 200+ file formats! Works on Windows 10, 8, 7, Vista and XP - both 32- and 64-bit versions. Download and install FreeFileViewer and you will be able to view documents like DOC, DOCX, PDF, TXT, XLS, XLSX, images like JPG, PNG, GIF, PSD, videos like FLV, MP4, MOV, MPG, audio files like FLAC, MP3, OGG, WMA, and various other formats like BIN, CFG, DAT, DIZ and and many many other file formats - more than 200 supported! FreeFileViewer is a non-bloated, simple file viewer and music player. For example, it will enable you to display Adobe® PDF files and Microsoft® Office documents without Adobe® Reader® or Microsoft® Office being installed, and PSD files without having Adobe® Photoshop® installed. 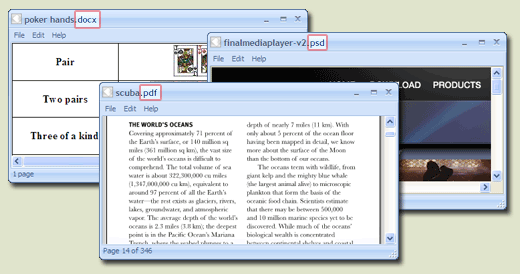 This is the all-in-one file viewer product you have been looking for! Everything is included with the installer. 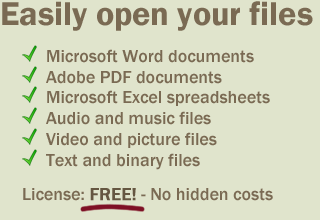 Simply download and run it and you will be able to view your files right away. No other software required.